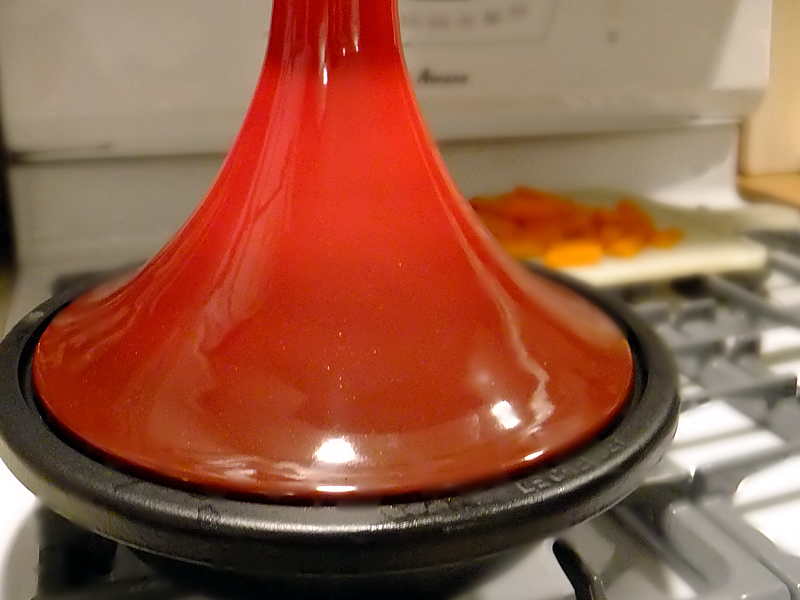 For Valentine’s Day I got a Le Creuset tagine accompanied by a new Moroccan cookbook (swoon). I’ve read articles that discourage men from buying their spouses kitchen or other household paraphernalia for Valentine’s Day. I totally disagree. A few years ago I got an amazing vacuum cleaner. Every kiss begins with Kay Dyson. A tagine is kind of like the original slow-cooker. It’s a Moroccan clay or cast iron pot with a tall, conical lid. The lid allows steam to circulate above the food and then funnel back down into the dish, keeping food moist and evenly cooked. It’s also super cool looking. If you’ve never had Moroccan food, this recipe is a good introduction. It’s delicately spiced and kid-friendly. If you prefer more spice, I would recommend DOUBLING the spices (except the paprika). Don’t fret. If you were given earrings or a bracelet for Valentine’s day you can still make this recipe. Try it in a large saucepan or Dutch oven with lid. Heat oil over medium heat and add the onion, garlic, and ginger. 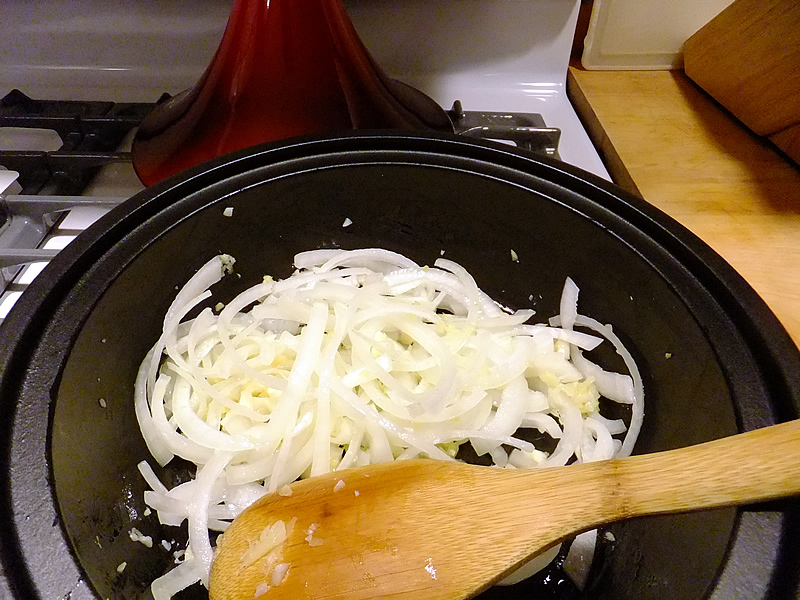 Saute until onions begin to soften. Stir in the next 6 spices and cook for 1 minute. 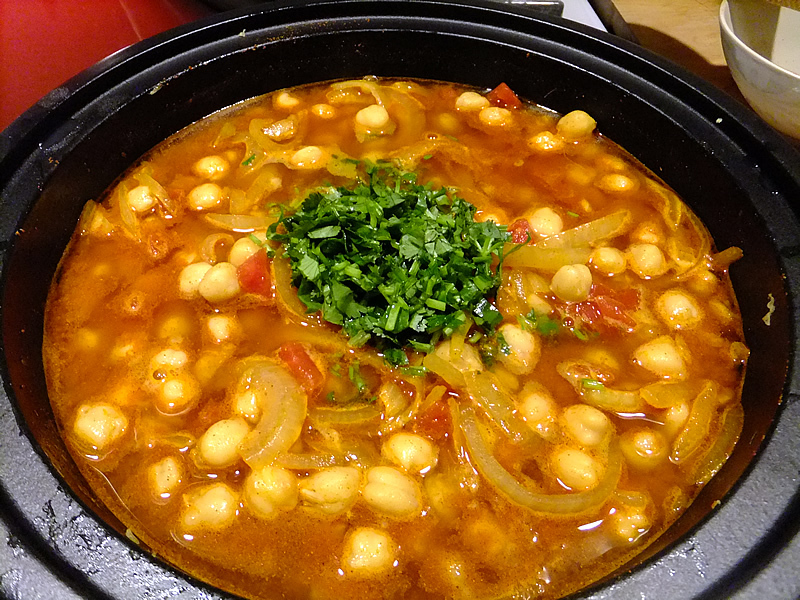 Add the water or broth, chick peas, tomatoes, cilantro and lemon juice. Bring mixture to a boil, reduce heat to low, cover and cook for 10 minutes. Sprinkle chicken pieces with the Vann’s salt exotica and add to the pot. Cover and simmer for another 30 minutes. Toss in the carrots, replace the lid, and cook for 15 more minutes. Season with salt and pepper to taste. Luckily it’s finally done because by this point the aroma has permeated the entire house. 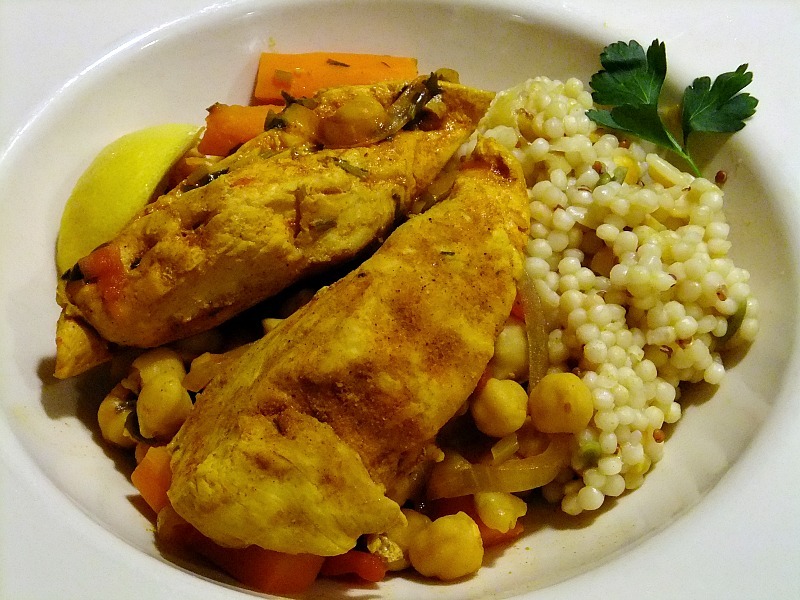 This can be a complete meal on it’s own or served with a side of bread, rice, or couscous. Garnish with lemon wedges for additional juice. The base of the dish reminds me of an Indian dish called Chole. Will have to talk Michael into Tagine!!! Looks very yummy!!! Thanks, Lisa! I’m sure you and Michael could whip up some amazing stuff in one of these. You are making me soo hungry…..